Being Post-Mature in the Spring. It’s a Grandfather Spring. Those words don’t go together well, any more than watching elderly horses in the freshness of the season. I wouldn’t trade a moment. My Grandfather Horse survived the winter to see another birthday. After our emergency vet call in November, you might wonder. I’m happy to report no more high drama about … well, it’s a bit embarrassing. (read here). And it’s finally spring. You can tell because the wind is catapulting tumbleweeds instead of snow most of the time. My Grandfather Horse and I have a game we play every spring. Just when the grass is it’s best; that time just after a spring blizzard and just before the hot midday sun scorches baby grasses crisp, I accidentally-on-purpose forget to close his gate. Silly me. And he moves like a serpent, slowly to the gate, then flings it hard with his nose and squeals as he gallops out, tail flagged and proud, with his tiny herd of mares in hot pursuit. He is always incredulous at my foolishness and his luck. My Grandfather Horse got retired for cause, a tendon injury that took months of stall rest to heal, giving his arthritis time to cripple him. Watching him canter on two lame legs and a very weak back was frightening to watch, and there was always hang-over soreness the next day. But it was so worth it for that desperado’s escape. He gave up his wobbly canter a few years ago for a bone-jarring trot. I don’t let the mares join in anymore, it would hurry him too much. And last year, he made his annual escape at a walk. I’ll be kind and call it a race walk, but his hooves barely cleared the ground and his legendary tail was quiet. This year the birthday break-out day came, and I didn’t latch the gate as I left to muck another run. My Grandfather Horse stood still, eyes half closed in the morning sun. I pushed the gate wider and still he took no notice. Finally I walked up to him and scratched a handful of long, gray hairs loose. I turned but he didn’t follow, so I slipped a twine around his neck and waited for him to shift his weight into a walk. We sauntered out together. Our pasture is prairie grass, some sage, a few cactus. There is only one really exceptional patch of grass on the place. You know the kind; wider leaves and so moist it smells sweet. We made our way to the place behind the horse trailer with the special grass and I let loose of the twine. He walked a few steps and dropped his head, not even a rush now. It was a slow morning so I plopped down to the ground to keep him grazing company. I did what I always do; I reminisced with him. Remember how afraid you were when we met? Remember sharing watermelon at horse shows? Remember that way you had of kicking me in the arch of my foot when I over-cued flying changes? The Grandfather horse retired ten years ago but the first couple of years where the worst. He was angry that I quit him. He was right, the injury didn’t matter. I could barely meet his eye. He refused to stand for the curry. We were both depressed. Spring is the time of year for grand plans. Reclining there on the grass, I thought about what I’d like to accomplish with my young mare this year, ideas I have for my clients and the horses here for training. I notice I don’t have any plans with this grand old man. I do nothing with him. We aren’t a young herd anymore. Some of us are literally or figuratively old goats. My Grandfather Horse and I have much more history than future. It hurts to admit but it’s agonizingly undeniable that our best days are not ahead. Some of our favorite friends, his contemporaries, are not with us this spring. We can’t feel lucky when others are mourning. This summer I am going to do nothing with him –much more often. beautiful, oh so beautiful. And when that moment comes when doing nothing is not even an option, it will be so sweetly bitter. You know, as I do, that all those memories end in that flavor. It is a small price to pay for all that comes before. I do try to remind myself that it is a small price to pay, but it seems overwhelming in the end, and for long weeks after. I’m finding myself crying quietly after reading about being post-mature…… Guess that hit home. Thank you for what you share. Thanks, Holly. Is there anything more bittersweet? You have again touched my heart! My grandfather horse is now 36. We “do nothing” also. Yet he requires so much time to clean up his mushy food pans, curry the sticky off his sides, bath him and clip him that I probably spend more time with him. Because of his Cushings we do multiple body clips each summer so that he can survive the South Carolina heat. But we have the doubters who think that I have let him live too long. His still tries to roll, but his arthritis is bad on his right side that if he forgets and rolls to that side, he can’t get back up. He waits until I find him and then we call for help and put ropes around his legs so that we can roll him back over to his left side. Once back on his left side, he pushes himself back up on his feet without any help. Sometimes he is shaky if I have taken too long to discover his predicament, but he always gets back as soon as he is on the good side. It is hard to see him lying there, but as long as he wants back up and gives me attitude, I don’t see any reason to not give him the chance. I think that I know him so much better than anyone else, that I will know when he gives up. But not yet… he isn’t ready yet… Thank you for your blog and the stories about your grandfather horse. We really do need that support group! Is there anything skankier than an old campaigner? Love it. And I have had others tell me the time, I trust this boy, too. Because that is the biggest thing. Trust. Thank you! I look forward to many more stories about your Grandfather Horse! God bless them! I am already doing “nothing” with my young horse. On Tuesday he got his spring vaccines, so had the day off. I led him to the best grass. Is there anything more peaceful and fulfilling than standing companionably with a grazing horse? I hope we’ll have as many good years as you and your Grandfather Horse. Wonderful – brings tears to my eyes! Still partners but at a different pace. Wonderfully poignant – I hope your do-nothing-but be-together moments are sweet and often. You both deserve a little peace! Tears on my cheeks. Savor the do-nothing times and make them frequent as you can. Bless you for loving him so well. Wow! Your experiences with your grandfather horse closely mirror my own. 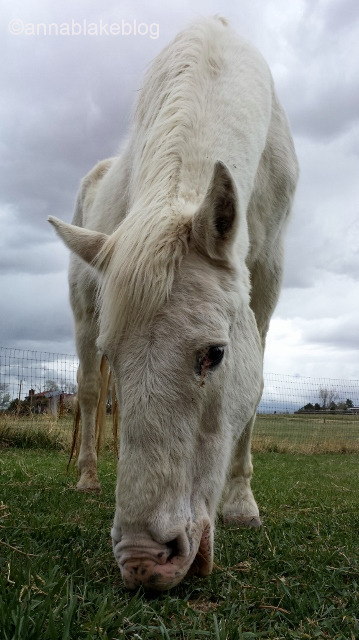 My oldest horse turned 28 this year, and I’m finding it difficult to watch him slowly change. He too seems to enjoy simply doing nothing nowadays. We often stand next to each other and after sharing a snack, will simply breath together and watch the world around us. “Doing nothing” together seems important to do at this stage in the game for us. I sense something deeply meaningful happening between us when he choses to hang out with me. Sad but sweet all at the same time. Thank you for sharing your thoughts and reminding us of the value of taking the time to “do nothing”. Thank you for sharing your grandfaher horse. I am very lucky that my old guy (29 this year) is still very sound and still the Alpha of the little herd. We too have a lot of history (he’s been with me for 22 years). I pulled out a photo the other day of our first dressage show together. I still see that strong and shining young horse when I look at him. What good vision you have. Thanks for this comment, Monika. It takes a different kind of courage at this age, for both of you. Talk about laughing and crying! How could I EVER have anything but respect for you for calling the vet out to clean his sheath? Remember, I got laughed at by someone we both know and love for calling the vet out on a Saturday when Jackie got a bad rope burn? I would have done the same damn thing. The grandfather horse is also remembering his fabulous life with you in retrospect as the summer days grow shorter for him (and us, too, by the way) and the nights just a little longer in his and our lives. That’s amazing, 42! How strong he must have been. Thank you for commenting.